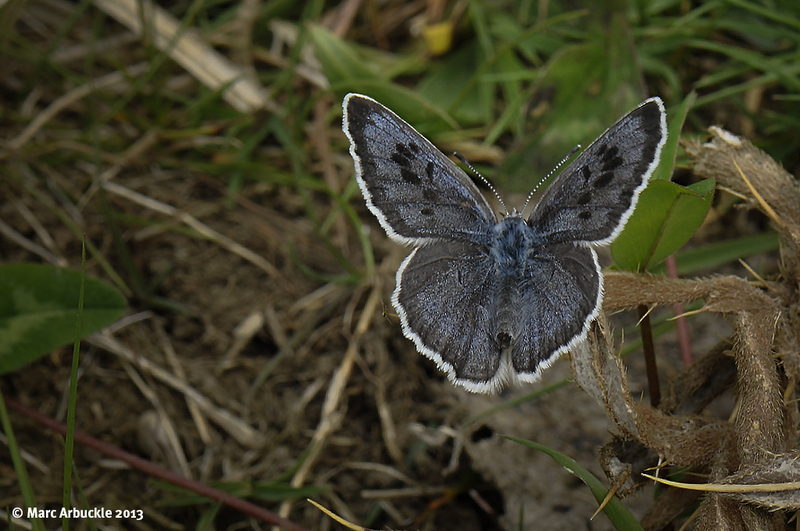 Sunday before last I drove down to Somerset to catch a glimpse of the Large Blue Maculinea arion. Always a rare insect, our native Large Blue became extinct in 1979. It has since been reintroduced from stock brought in from Sweden to various sites in southern England, most of which remain ‘secret’. However, Collard Hill which is owned by The National Trust is open to public access. Thirteen years ago larvae were introduced there and the population has now grown to the point where it is one of the best sites in Europe to see this rare butterfly. Well, at least it has been. Last year’s extremely wet summer and this year’s cold spring haven’t helped. But that’s not the only problem it has to contend with. Foghorn then walked around the side of me and in the process of bending down to take a photo scared her off with his shadow. The buffoon then clambered to his feet and shouted out ‘There’s a Large Blue here’. He then galumphed up the slope to where she next settled spooking her again. He then took out his mobile and phoned his friends to get their attention, waving them in like someone calling in an air strike. I looked around and to my horror from almost every direction people were homing in on us like zombies from a B-Movie. He then spotted her again and this time the great lummox got down on all fours and began snapping away like a man possessed. For a second or two while he had his fat arse pointing skywards I had an almost overwhelming urge to fire one of my walking boots deep into his corduroys. Calculating the difficulty of retrieving it and explaining the mishap to the warden I decided to leave. Perhaps I’ll return another day. Or then again, perhaps I won’t. So apologies for the rather poor photo. I think this excerpt from The National Trust’s Large Blue blog rather sums up the day for me. How bloody frustrating Marc, but your post did make me laugh! 😀 I’d have wanted to aim a well-placed boot up his sky-pointing arse too! After two hours of staking out the silver studded blues on Wednesday morning, just as they were opening their wings to the sun, a galumphing great labrador went repeatedly crashing through the heather they were sitting on. It wasn’t the dog I was annoyed with, but the numpty owner who kept letting it go again even after I caught it and returned it twice. It was frustrating but I guess his enthusiasm just ran away with him. Shame though as I’d have liked to have got a better photo. There’s always next year I guess. Don’t get me started on some dog owners though.